One of the great challenges in working on training or any other kind of major initiatives is how to build support and consensus while leading to a successful conclution. That’s where good consulting skills come in. As a side not, I had a discussion the other day about the difference between consultative selling and consulting. Consultative selling is a style of selling where you identify customer needs, issues and problems and then present an appropriate solution. In consulting, you’re taking customers through a displined process or problem solving while applying your expertise. In consulting, you are often the product or service. 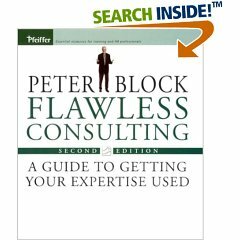 Here’s probably the best book to start with Peter Blocks, Flawless Consulting, a guide to getting your expertise used. The techniques and methodologies are good for both internal and external consulting.